Now that Google has announced they’ll be working towards getting sites to better suit mobile and voice search, they’ve also posted a new series of articles that explain how Google search works. This is to help website owners and digital marketers become better informed on how to optimise for search. 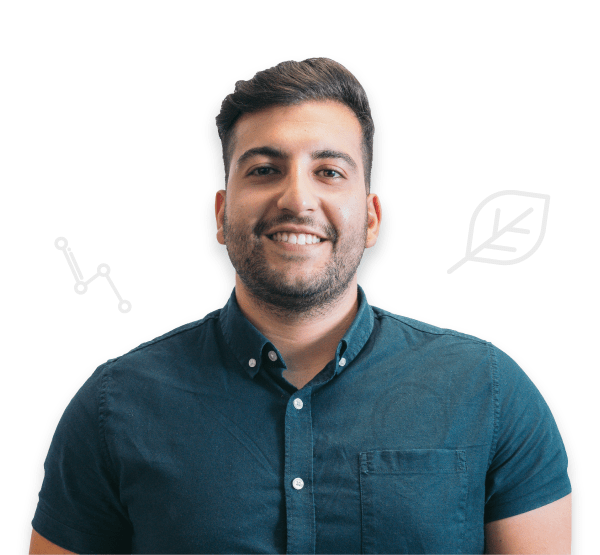 The first of which talks about their featured snippet. Within the article, they explain how featured snippets work, the problems they’ve faced since launching and how they overcame or are planning to overcome said problems. We’re going to take a look at the featured snippet from a Digital Marketing point of view. A featured snippet is a descriptive box at the top of the organic search results on Google. Regular web listings have the page’s SEO title (also known as the title tag) first, then the description (meta description). Contrary to feature snippets that have a reversed format, where the page’s description get’s show before the site gets any recognition. This makes it much easier and faster for the user to grab the information they require. Which makes a lot of sense when you remember that Google is pushing mobile and voice search as their main focus point. What’s the point of Google’s featured snippet? It’s much better to view the description – which should briefly answer the query – first than have to scroll down your mobile to read it. This goes back to the original reason for search engines – to give users the information they require. And to provide the information fast, with efficiency and accuracy. They are now also working to provide information that’s even more simple to access and content that’s easy to digest. This format isn’t purely for mobile search though, it’s also much better for voice search. It makes the information easy to access and hopefully the information will be from an accurate source – which we’ll go into more detail soon. 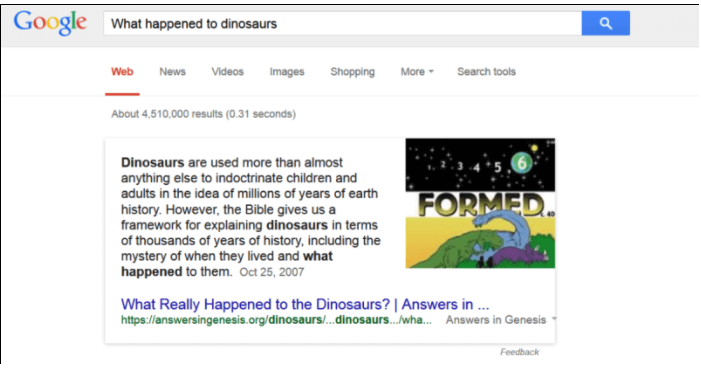 Don’t get the wrong idea though; featured snippets aren’t only text-based. 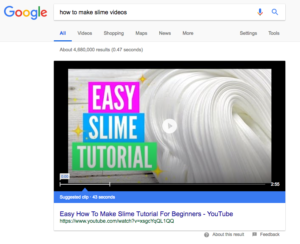 They can feature videos, but not only that, they also put the user exactly in the place of the video that gives them the specific information they searched for. Now that’s pretty smart. Moving onto spoken feature snippets, a test was carried out by Stone Temple which resulted in a 97.4% accuracy rate for featured snippets using voice-search. What does this mean? It proves that featured snippets give us information that is reliable and correct – most of the time. Something that not many people know is that Google has ‘raters’ who test the usability of their new algorithms. This is measured by Search quality rater guidelines and recently these guidelines have been adapted for raters to easily flag low-quality content and give them information on how to recognise useless content. By testing and experimenting, Google is finding better ways to show near-matches when there simply isn’t enough accurate data to show in a featured snippet with confidence. Let’s face it, sometimes Google doesn’t have all the answers, and that’s perfectly reasonable seen as Google gathers all their information from us. Hence, it’s our job to give Google those answers and to be the ones that are reliable and bold enough to catch their attention. Bonus fact: According to Search Engine Land, around 15% of all Google searches have never been searched before! What about the other 2.6% that are incorrect featured snippets? Back to Google finding the best information, from good sources, that rank the almighty position 0 (featured snippet). So far we’ve learnt about what a featured snippet is and why it’s so useful, but how do they find the correct information to feature? Well, sometimes they don’t. Google is beginning to test ways that will prevent these wrong answers being shown. For example, a recent feature they’ve added is the multiple options that appear when a query could be answered different ways, depending on a specification. You click the specification that you’re after and theirs your answer. Are answers contradictory depending on the way you phrase your search? Sometimes, yes. This has been known to happen, especially when you search queries like ‘Is …. bad?’ and then search ‘Is … good?’. You’ll usually see a contradicting answer to the first search you typed in. This is because Google favours content that contains the keywords typed in. 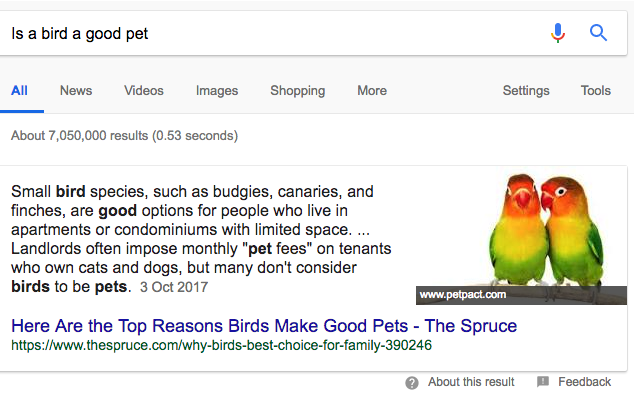 For example, when I searched ‘is a bird a good pet’ it came up with all the good reasons for owning a pet bird. Whereas, when I searched ‘is a bird a bad pet’ it came up with reasons why not to get a bird. Here’s the example, although the second search result didn’t have a featured snippet, the point remains valid. They have admitted to this error and are working to fix it. One way they’re testing out is to show multiple featured snippets in the hopes that any contradictions and opinion-based answers are balanced. In essence, they want their results to show diverse and legitimate perspectives for users to expand their own views upon. In addition to this, Google has the ‘feedback’ link that sits beneath the information in a featured snippet. It allows users to comment and suggest improvements that Google could make. There’s also a multiple answer question that you can fill out. What are the pros of featured snippets? It offers users immediate answers for question-based and informative-seeking searches. It’s also a great place to strive to position for, as a website owner. As for the cons? It’s been shown that featured snippets are ‘stealing’ traffic from organic search results. It also has decreased Click Through Rate overall. Google is adapting to the mobile and voice-search world that we now live in and that’s a good thing! 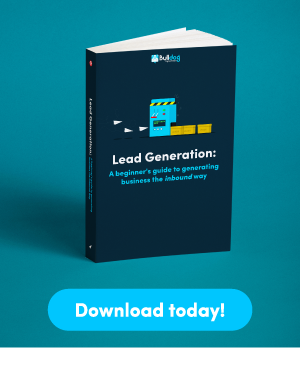 But, it seems as though marketers and website owners are going to have to follow their footsteps in order to keep up with the forever changing world of search. Do you find featured snippets useful? Leave us your opinions on the matter.